The Large Rose Soap (as pictured in my hand) retails for just $3.25 with no minimum order required. Debbie runs this handmade business out of her home and makes sure that every detail is just perfect for you. I currently have this rose soap sitting in my half bathroom. It makes the entire room smell just so lovely. Find Uniquely Pampered on Facebook and Etsy! Thank you Holly for posting the review. Glad you like our soap! 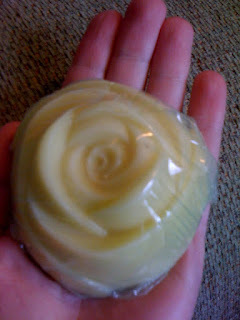 We have updated our product prices for the 2011-2012 year, and the large rose soap is now $3.55. We have also added a wonderful selection of new fragrances! Visit our site during May for our Customer Appreciation Event. Thanks again!